Diamond Is in Love, Again - but Who Is the Lucky Woman? NRG radio presenter Tanasha Donna says video of her and Nigerian artist Wizkid is not news to her and new boyfriend Diamond Platnumz. 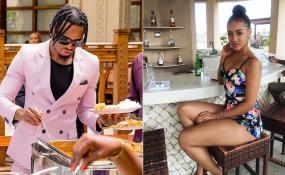 Diamond Platnumz’s latest catch Tanasha Donna has reacted to a video which has emerged online showing her leaving Nairobi’s high end club, Kiza Lounge, with Nigerian star Wizkid. The Fever hitmaker was in the country last month for a gig at the Katika Festival. During the visit, Wizkid took time to party at Kiza Lounge in the company of his crew. Tanasha, a presenter at NRG radio, was seen mingling with the singer as they enjoyed themselves at the VIP lounge. Tanasha, who happens to be actor Nick Mutuma’s girlfriend, reacted on her Instagram page by saying the video is not news to her and Diamond. “Why don’t you tell us something me and hubby to be don’t know already,” Tanasha wrote.